For years, Clarence Holbert saw most money-related projects go to his colleagues. When an anomalous request to design the Eritrean currency came to him as part of the miscellany in 1994, it was a dream come true in a lot of ways. His finest moment as a bank-note designer was also his last: The Eritrean project. In a February 10 interview with the Washington File, Holbert proudly took credit for designing the paper money and coinage Eritreans use today. When the newly independent country of Eritrea came to the U.S. Bureau of Engraving in 1994 to ask for help in designing its currency, the Bureau assigned the task to Holbert. Holbert, who retired from the Bureau in 1998, said the request was a “dream come true in a lot of ways. Holbert — a Washington native who grew up as a child constantly drawing and scribbling — said he spent two and a half years designing the paper bills and coins Eritrea would use for money. It took almost the same amount of time to produce the plates and print the money, he said, which was not officially released until November 8, 1997. As an adult, Holbert continued to hone his artistic skills while working his way through college as a security guard at the U.S. Bureau of Engraving and Printing — where U.S. banknotes are produced. “When I was a guard, anything that had a white surface on it, I would draw on it,” he said. “People came by and they would collect them.” Word got around and Holbert was offered a job as an apprentice banknote designer at the Bureau. “With it being a new nation, there was not much material available on the country,” he said. “What resulted was that many Eritrean artists took about a hundred pictures of everything from farmers tilling their fields to children studying — people across the whole country going about their everyday lives were represented in the many, many pictures.” After working up initial designs based on the pictures, Holbert said he visited Eritrea to get a better understanding of the country and its people. Arriving in Asmara, Holbert said he immediately realized that Eritrea is an amazing place. “When I first came there, they were building. I was just amazed that after the war, how they were taking the old war materiel and just making what they needed to meet the everyday needs of the country. “I was immediately impressed with the informality and friendliness of the Eritrean people,” he said. “I was amazed by their building projects underway. Men and women were working alongside each other along with former soldiers. What was very apparent, he said, was Eritrea’s ability to use old and new things to bring about a change in the country. “You could just see the improvement taking place. It seems that they had gotten beyond where a lot of the other African countries were — where there was a lot of infighting amongst themselves. The Eritrean people were united and moving forward,” towards a single goal. Holbert said he had been privileged to meet with the person who authored Eritrea’s declaration of independence and constitution. “I was amazed because I began to realize that I was being allowed to become part of another country as it came into being. Just like our country fought and got our freedom…. I was in awe once I sat down and realized what was actually going on. “To me,” he added, “it showed the determination of a people to establish an identity for themselves in a world and they have included everybody in it.” Holbert proudly noted that all the country’s ethnic groups are represented in the designs on the money. 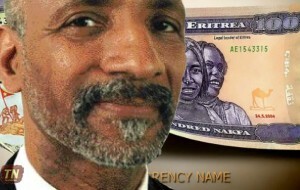 The currency, Holbert recalled, “features the everyday people of Eritrea because Eritrean President Isaias Afwerki had given specific instructions that the money not feature cabinet or government officials or their relatives.” The president, Holbert explained, wanted the new money to reflect the common people. Additionally, he said, the president did not want the money to be in color but wanted all the notes to be the same size. He wanted his people to be able to read the bills easily. While all the bills are the same color and size, Holbert said, they do “tie together” in their design. On the front of each note is a small drawing of the raising of the Eritrean flag during the decisive battle for the country’s independence. The money takes its name, the nakfa, from the site of that historic conflict. Holbert said the money was designed and issued in a 1, 5, 10, 20, 50 and 100 denomination both in bills and coins. Once designed, the yellow, brown and green nakfa bills, which give off a flesh tone color, were printed in Frankfurt, Germany and the coins minted in England.